Although New York’s spring thaw is underway, there’s a lingering chill that requires something to bridge the gap between turtleneck sweaters and crop tops. One could easily join downtown legions with a mid-weight army jacket, but the mood of the season — handbagsincluded — makes me want something more ladylike. This is what I had in mind when I rescued a crumpled black cashmere jacket from the bottom of my closet. The jacket fit was the right cut, but its lining — plain black silk — was tattered. I’d been dying to integrate some ofDolce and Gabbana’s seasonal Sicilian spirit into my wardrobe, but am not exactly on a budget for that. So a fresh printed lining — and some inspired buttons — got me there much more affordably. Here’s how you can take a similarly tired topper and freshen it up, in five easy steps. 1. Choose your jacket, focusing on fabric and shape. If you’re anything like me — a mild hoarder — your new spring jacket may already be in your closet. I purchased mine incidentally when I wanted a pencil skirt and its owner insisted on selling the vintage cashmere set as a suit. I always liked the jacket’s cropped cut and round collar, but even with jeans, it felt a bit “somber granny.” Plus, the black silk lining was frayed, sagging, and hanging out of one cuff. 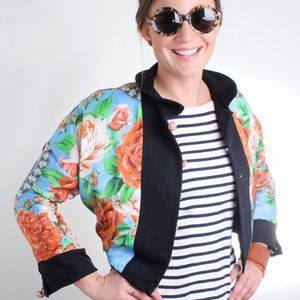 If you don’t already own your jacket, try a reliable secondhand store. Choose something in a shape you’ll look forward to layering for spring: picture it with dresses, pants, and even shorts. (I noticed thatGiambattista Valli paired a jacket similar to mine with hotpants and a very sheer chiffon skirt.) Look for something that will cut the frigid chill of office air conditioning without looking wintery. Cashmeres, wool/silk blends, and fun fuzzy bouclés can all fit the bill. If the jacket already has a lining, that will make the next steps easier/less expensive. Bonus points if that lining is ugly. 2. Find a cheerful fabric that will feel good next to your skin. Rather than repairing my jacket’s plain black lining, I wanted something more springlike. Silk charmeuse feels slippery and soft, and ensures vibrant prints look richly saturated. I was thinking ofDolce & Gabbana and Suno’s spring 2013 florals when I went toMood Fabrics. If you live in New York, it’s worth a visit to the Project Runway stalwart, where rolls of designers’ “end cuts,” or leftovers, are often stuffed into cylindrical containers just to the left of the entrance. One recent morning, I found printed silks designed byValentino, Pucci, and Ferragamo there. I’d suggest hitting Aisle 3 — where all the other silk prints live — before you hit the designer stuff, because you may find something suitable for less money. For me, it was too late. I had already fallen for a Roberto Cavalli sky-blue silk exploding with apricot-colored roses for $70 per yard. In aisle 3, I saw printed poppies, pale pink seascapes, and pop-art cupcakes, for around $18 per yard, but they all faded in comparison to my crazy Cavalli blooms. I had brought my jacket with me, and a salesperson said a yard of fabric should be sufficient for relining it. Mood’s website allows you to shop online, searching by fabric type and designer, but there are many more options in the store. Out-of-towners may have better luck with neighboring B&J Fabric’s extensive printed silks online. 3. Consider your closures. My fun new floral lining fabric seemed completely incongruous with my jacket’s serious black horn buttons. Since Dolce & Gabbana’s spring 2013 collection — with its awning stripes, raffia skirts, and bold floral prints — inspired my fabric choice, I thought it may help with buttons, too. I went to M&J Trimming thinking of something textural like raffia. There were a few options wrapped in something like hemp twine, but when I tried pushing them through my jacket’s buttonholes, they shed everywhere. (If you don’t bring your jacket, at least bring an existing button to make sure you buy the correct size.) Instead, I found some buttons covered with braided leather of a similar tan color, for $1.59 per piece. It’s a good idea to buy a couple extra, just in case you lose one and the style is discontinued. 4. 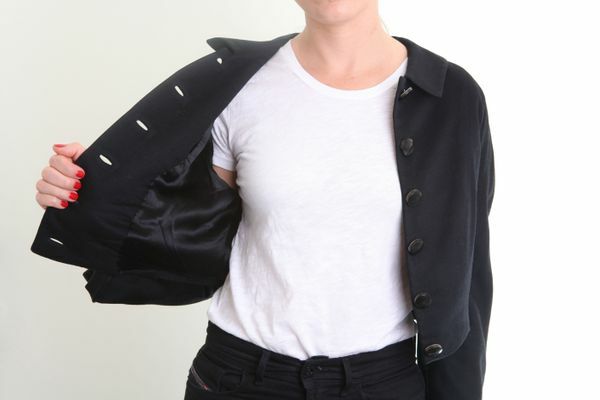 Transform your jacket (or pay someone else to). If you are blessed with sewing skills, go for it. Here’s why it’s good to choose a jacket that is already lined: A skilled sewer can remove the lining, use it to make a pattern, and whip up a new one. I, on the other hand, can recommend a good tailor to do that for you. I took my jacket, fabric, and buttons to New York Tailor Shop on Kenmare, and showed Jesus exactly where I wanted the print to lay inside the jacket. He told me the job — including changing out the buttons — would take a few days and 60 dollars. That seemed totally fair, and he did a beautiful job. 5. Enjoy … every way possible. Pick up your jacket, toss it over your shoulders like a street-style star, wear it like a normal person, or pair it Giambattista Valli–style with hotpants and a scrap of sheer chiffon. (At least your torso will be warm, and according to Marc Jacobs, this looks extends into fall.) I even discovered a bonus when I tried my jacket on inside out and it recalled a Claw Money–ish printed silk bomber. And thanks to that floral lining, when the weather finally warms up, it’s going to look great draped over a chair.